Pioneers in the industry, we offer straight micronutrient fertilizer, disodium octaborate tetrahydrate(b-20%), chelated iron fertilizer (feeddha) and ferrous ammonium sulphate from India. We at Agri Search (I) Pvt. Ltd are manufacturing various straight micronutrient fertilizers forSoil Application at our state of the art manufacturing facility under Anmol Series as under. Dose :-Soil application / Fertigation :- @ 200 to 500 gram per acre & 25 to 50 gram as foliar spraydepending upon deficiency in the soil & crop response to Molybdenum. Dose:-Soil application / Fertigation:- @ 2 to 5Kg per acre depending upon deficiency in the soil & crop response to Boron. Dose:-Soil application / Fertication :-@ 10 to 50 Kg per acre depending upon deficiency in the soil & crop response to Magnesium. Content :- Zn – 21%, Sulphur – 10%. Dose :-Soil application / Fertigation:- @ 5 to 10 kg per acre for Zinc deficient soils & crop response to Zinc. Dose:-Soil application @ 1 to 2 Kg per acre in Copper deficient soil particularly where organic matter is high & for crop response to Copper. Dose:-Soil application / Fertigation :- @ 2 to 5 Kg Per acre for Manganese deficient soils & for crop responseto Manganese. Content :- Iron – 19% MinSulphur - 10.5% Min. Dose:-Soil application / Fertigation :- @ 5 to 10 kg Per acre for Iron deficient Soils & for crop response to Iron. 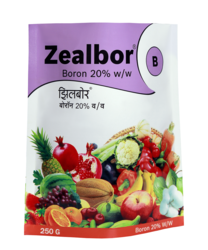 Zealbor is a water soluble Boron micronutrient fertilizer. Boron :-The main function of Boron relate to cell wall strengths & development,cell division, fruit & seed development, sugar translocation & hormonesynthesis.The Boron requirement at flowering & seed set may be higher than that needed for vegetative growth.Boron (B) has a significant effect in pollen germination & pollen tube growth. The viability of pollen grains also decreases when B is deficient.Boron (B) deficiency increases the drop of buds & flowers, resulting in significant reduction in seed & fruit set & also in the quality of fruits,seeds, nuts etc. Boron maintains calcium (Ca) in soluble form & thus ensure its proper utilization. Both soil & plant tissue analysis is strongly recommended to assess the available Boron status for all commercial crops. A combination of soil Dose & foliar sprays, depending upon the plant species may be needed when results of soil & Plant analyses indicate a low supply of available Boron for the current crop. formation, germination and fertilization just prior to seed & fruit set.Foliar applied Boron is rapidly absorbed by the leaves and flower buds. dissolved in 100 Liters of clean water & spray during cooler parts of the day i.e. early morning or late evening. 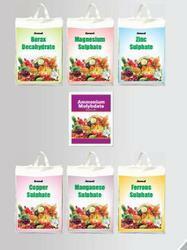 Soil Application / Fertigation :- 500 gms per acre per application. pesticides normally used.But we recommend “JAR TEST” before mixing with other inputs. Packing:- 100 gm, 250 gm, 500 gm, 1 Kg, 5 Kg Bucket. Calcareous soils.Lohadrip is the 4.8 ortho – ortho isomer which only performs in the soil, particularly in calcareous soils. 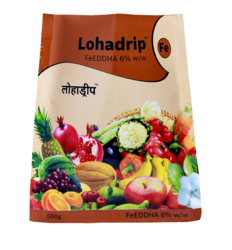 Benefits:-Lohadrip contains 6 % Fe as FeEDDHA & is most powerful isomer for alkaline & calcareous soils.Lohadrip is recommended for fertigation & hydroponics & not for foliar spray.Lohadrip is most ideal Iron fertilizer for Grapes, Citrus, Tomato, Brinjal,Capsicum, Chili, Sugarcane, Pomegranate, Ber, Banana, & other crops. Dose :-Soil Application/ Fertigation :- 500 gm to 1 Kg per acre during peak vegetative growth. Dosage can be modified taking plant tissue analysis into consideration. Repeat if required. MOHAR is a crystalline water soluble solid containing Iron, Nitrogen, Sulphur. MOHAR is used mostly in the soils where, Iron is deficient and the soil is neutral to alkaline in nature. MOHAR helps to reduce thepH of the soil increasing availability of nutrients. MOHAR enhances quick & full greening response for Iron when combined with Nitrogen, in lawns, turf grass, vegetables and ornamentals. MOHAR eliminates Iron chlorosis by enhancing chlorophyll synthesis. MOHAR helps conditioning alkaline soils to allow uptake of immobilized soluble micronutrient salts. MOHAR generates, greater root growth, improved turf quality and greater recovery from draught, when frequent applications of Moharis carried out. MOHAR control the growth of moss while improving the growth & color of grass. MOHAR is useful for sugarcane, cotton, citrus,turmeric & ginger and many Iron responding crops. Soil Application / Fertigation :-	15 Kg/acre during vegetative growth Phase. 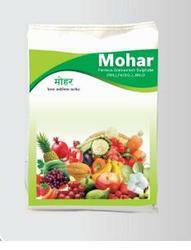 Compatibility:-MOHAR is compatible with almost all kinds of fertilizers except phosphatic fertilizers. Packing:- 1Kg for foliar Spray. 25 Kgfor fertigation or soil application. Looking for STRAIGHT MICRONUTRIENTS ?